The chili I wrote about yesterday contained no beef (it had turkey instead), was chock full of vegetables and had (gasp) beans. It's enough to send chili purists running for the hills. Or perhaps a hot cattle brand. I'd better watch myself. 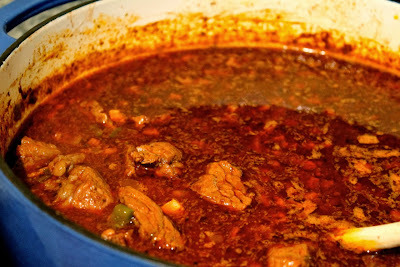 To satisfy the meat lovers, today I offer a traditional Chili Con Carne. No beans here and just a little onion and tomato puree for flavor and thickening. This dish puts the focus on traditional chili's two main ingredients: beef and chiles. America's Test Kitchen, always a good resource for basic dishes done very well, developed this recipe to be the "ultimate" version of traditional Texan chili: good chili flavor without overpowering heat, a rich sauce and chunks of meat. I say they scored big time. This chili was really delicious. Yes it's spicy, but not overwhelmingly so. 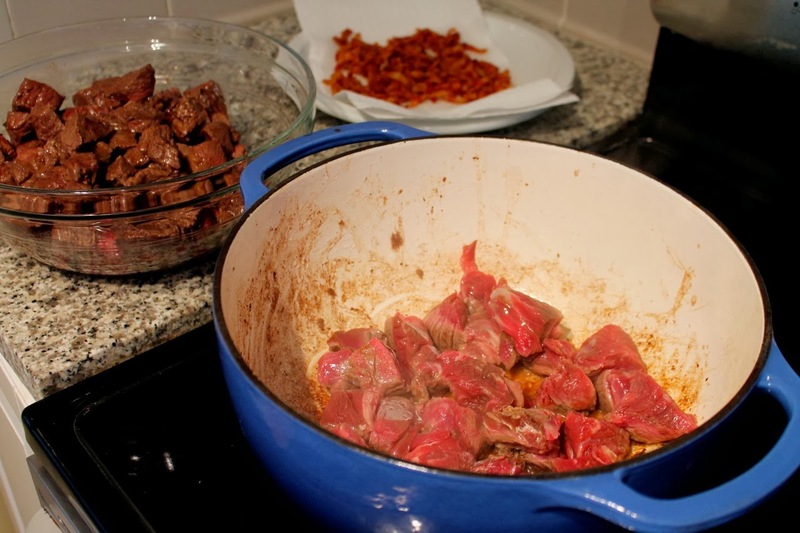 The recipe calls for chunks of beef rather than the more common ground beef, specifically beef chuck roast. Helpfully, Whole Foods sells beef chuck cubes for stew already trimmed of fat, which when cut down to 1-inch cubes worked beautifully in the chili. 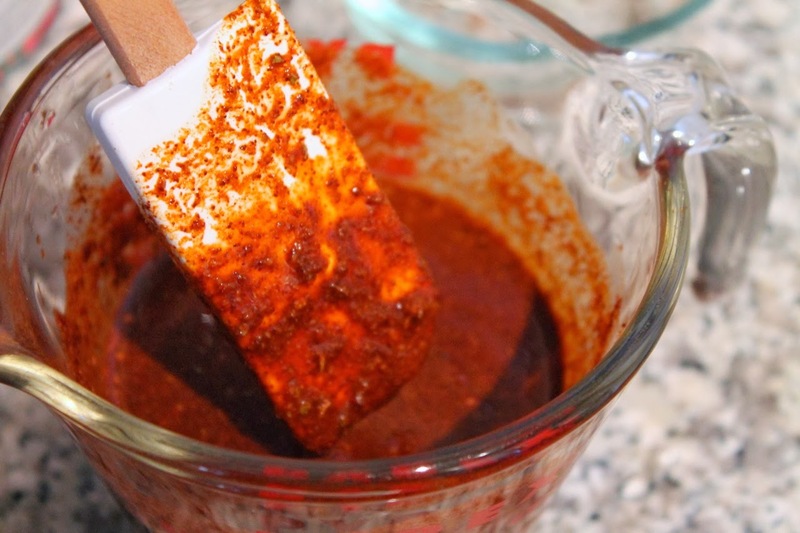 ATK recommends toasting whole dried ancho and New Mexico chiles for the best flavor. However, I was at a loss for finding the right ones, which was kind of surprising. I didn't see any dried chiles at Giant and Whole Foods only had the Asian variety. And I couldn't find "New Mexico" chili pepper. In fact, It was a bit irritated by the prevalence of chili powders labelled only as "chili powder" without more descriptive information about the type of chilis used. Even in the Latin food aisle at Giant it was just "chili powder." So I ended up with ancho chili powder and "regular" chili powder from Whole Foods. This may be why the dish wasn't overpoweringly spicy, but it was still quite good. If you can find the whole dried chiles, the recipe calls for toasting and grinding 3 medium pods of each variety (ancho and New Mexico). Chili after simmering for 2 hours. 1. Heat a small frying pan over medium heat. Add cumin seeds and toast until fragrant, about 4-5 minutes. 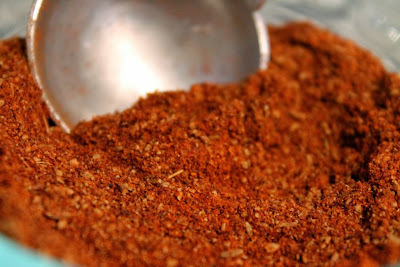 Allow to cool slightly and then grind the seeds into powder (I use a coffee grinder dedicated to grinding spices). Combine the ground cumin in a small bowl with the chili powders, dried cumin and 1/2 cup water, stirring to form a thick paste (it will thicken as it sits on the counter and you continue with the recipe). 2. Heat a large Dutch oven or steep-sided sauté pan over medium-low heat. Add the bacon and cook until the fat renders and the bacon is brown and crisp, about 10 minutes. Remove bacon with a slotted spoon and transfer to a paper-towel-lined plate. Remove all but about 2 teaspoons of bacon fat from the pot and set aside to use in the pot (I used a large spoon to scoop it out and transfer the hot fat to a glass ramekin--be careful, it's hot). Increase heat to medium-high. Brown the beef cubes in batches (four batches of 1 lb. each), adding 2 tsp. of bacon fat between each batch, about 5 minutes per batch. Set browned beef cubes aside in a large bowl. 3. Reduce heat to medium and add 3 tbsp. of reserved bacon fat. Add onion, season with salt to taste and sauté until softened, about 5-7 minutes. Add garlic and jalapeño and sauté about a minute. 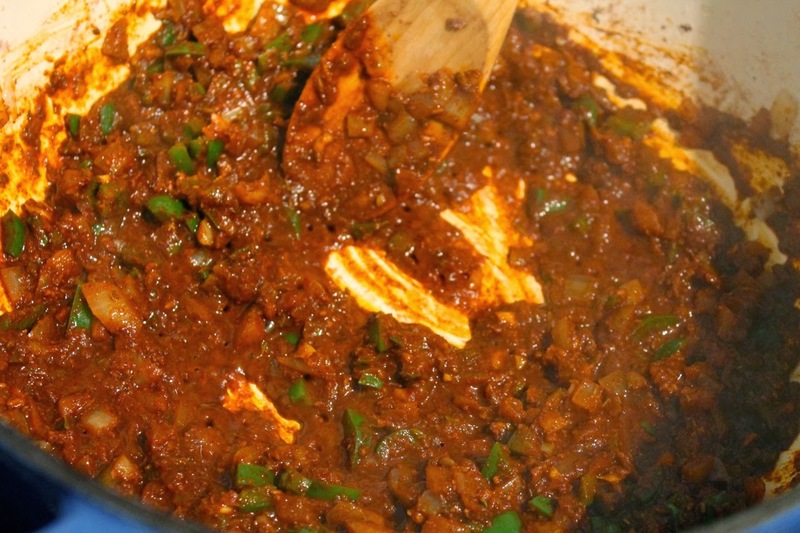 Add chili paste and sauté, stirring frequently, until fragrant, about 2-3 minutes. Add cooked bacon and beef, crushed tomatoes, lime juice and 7 cups of water. Increase heat to bring to a simmer then reduce heat to medium-low and simmer until the meat is tender and the sauce is dark and starting to thicken, about 2 hours. 4. Stir the masa harina with 2/3 cup water in a small bowl to form a paste. Stir paste into chili and increase heat to medium. Simmer until thickened, about 10 minutes. 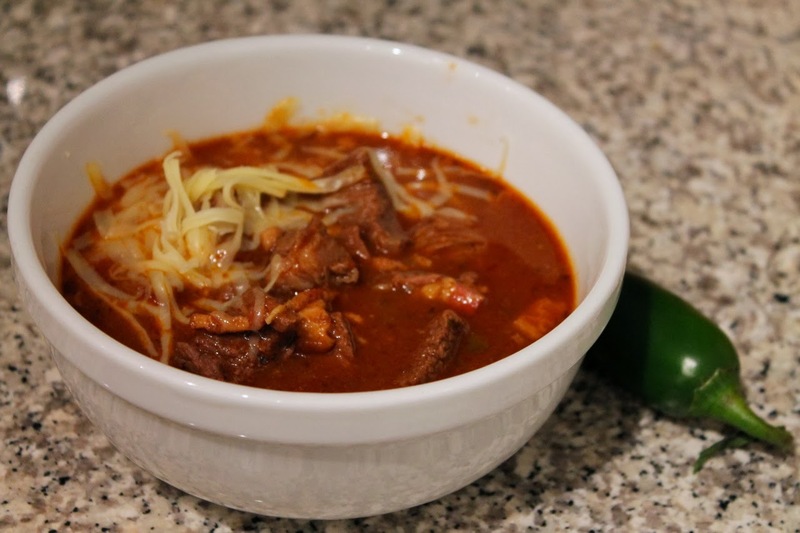 Adjust seasoning and serve chili in bowls topped with shredded cheese. This was good and I, for one, am glad it wasn't overwhelmingly spicy. Thanks for making it!